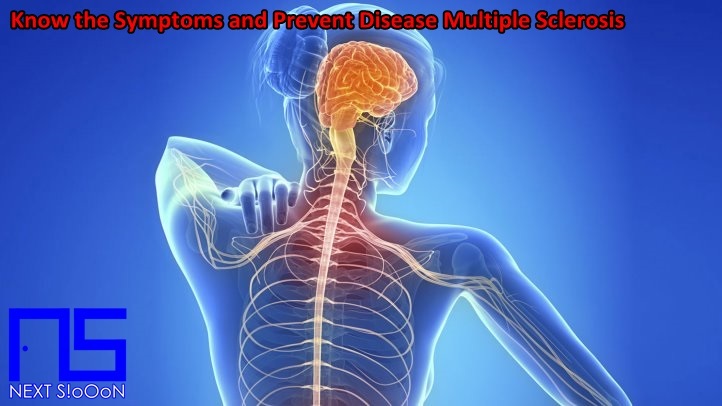 In this article Next Siooon will discuss about Disease Multiple Sclerosis, Information includes Understanding - Symptoms - And How to Prevent Disease Multiple Sclerosis. Disease Multiple Sclerosis - better known as a disease that attacks the nerve cell sheath or called (Myelin), the brain that is thought to be the cause is autoimmune. Myelin is known to be very important because of its function in the process of delivering nerve signals. In multiple sclerosis, myelin is damaged by cells that are actually body armor that are tasked with fighting foreign objects that enter the body, such as bacteria. In MS the cell misidentifies myelin and considers it an enemy that must be resisted so that it occurs demyelination, so that the nerve cells that have been bare because the myelin is damaged (demyelination) will have a malfunction. This disease is difficult to know because it can attack suddenly. There is a connection with genetic factors, there are changes in certain genes that cause the body's immunity to be very reactive. The end is also suspected that the season is very influential because it is found in many countries with 4 seasons. The virus is also suspected but until now there has been no type of virus that can be identified that is suspected to be related to MS. Tired body condition should rest, if the weather is bad you should not leave the house. Until now, MS has not been cured completely. Therefore, it is very wise if we all know the initial symptoms of MS, even though it cannot be cured, but if we can find out early and immediately take medication, it will be more effective so that the quality of life will be better. The initial symptoms of MS are usually blurry vision (blurred vision), often tingling or numbness, sometimes imbalances also arise. Other complaints that are often underestimated are fatigue, sensitivity to heat and cold, urinary disorders (unable to resist urination), difficulty concentrating and depression. Because MS is a slow-moving disease, these symptoms are often not a concern so that in the later stages the patient can experience paralysis. Immunomodulators can be given early, interferon, to improve the quality of life of other drugs can be given according to complaints that occur, for example painkillers, vitamins that can strengthen nerves such as Vitamin B. If you or your friends experience symptoms similar to MS , it is very wise if you immediately consult the nearest doctor. Do not do excessive activities that make the body sleep less (resting). Also keep food intake, the healthiest way is to consume lots of fruits & vegetables and don't even exercise. Multiple Sclerosis Disease, Multiple Sclerosis Disease Information, Multiple Sclerosis Disease Article, Multiple Sclerosis Disease Information, Multiple Sclerosis Symptoms, Causes of Multiple Sclerosis Disease, Factors Causing Multiple Sclerosis Disease, Multiple Sclerosis Disease Impacts, Multiple Sclerosis Medication, Relief of Multiple Sclerosis Symptoms, Overcoming Multiple Sclerosis Symptoms, Multiple Sclerosis Disease Symptoms, Multiple Sclerosis Disease Management , Things to do with Multiple Sclerosis, What is Multiple Sclerosis, Definition of Multiple Sclerosis, Information on Understanding Multiple Sclerosis, Symptoms of Cause and How to Overcome Multiple Sclerosis, Multiple Sclerosis Detail Info, Tips to Relieve Multiple Sclerosis, Tips to Overcome Multiple Sclerosis Disease, Overview of Information About Multiple Sclerosis, recognize the causes and symptoms of Multiple Sclerosis, prevent Multiple Sclerosis by knowing the symptoms and causes.